New to the GMI Newsletter? Join 165,000 Subscribers to our free Newsletter! A Revolutionary New Book To Heal Depression Naturally! 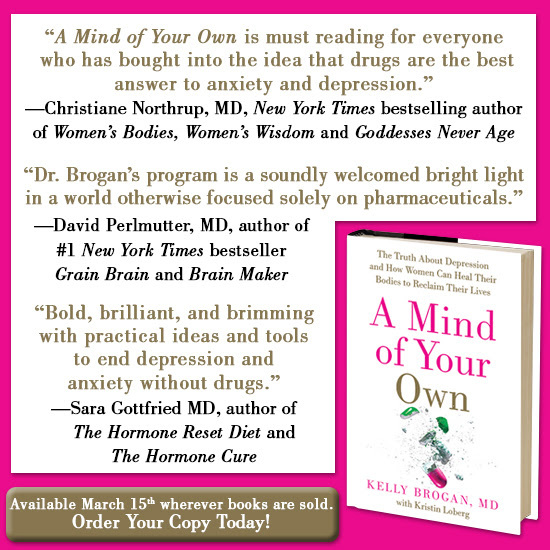 We are so excited to announce the 3.15.16 release of A Mind of Your Own, a groundbreaking new book by our very own advisory board member, Dr. Kelly Brogan. Those who are already fans of her brilliant work are sure to become excited at the prospect of getting a hold of her game-changing, 352-page manifesto. "Dr. Kelly Brogan has the rare distinction in her field of having successfully bridged the often insurmountable gaps that exist today between clinical experience, academic accomplishment, philosophical vision, and fearless activism. Most anyone who has taken the time to familiarize themselves with her work will find themselves both deeply challenged, enriched, but ultimately comforted in knowing that the future of medicine is already here, and its promise is extraordinary." you’ll find this book dispels common myths, and gives you the knowledge you need to truly heal. 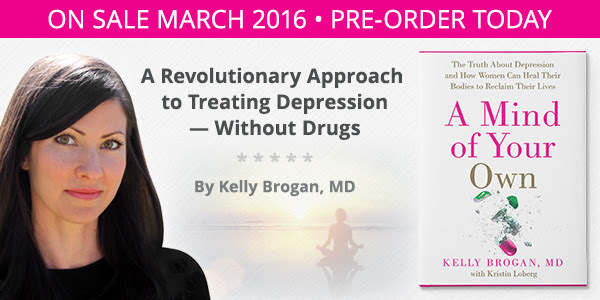 “A Mind of Your Own - The Truth about Depression and How Women Can Heal Their Bodies to Reclaim Their Lives” by Dr. Kelly Brogan is now available for pre-order, and is being offered for as low as 35% off by Amazon and 37% off by Barnes & Noble until its official release next month. The book is already rated #1 on Amazon for Depression – so don’t miss out! According to Dr. Kelly Brogan, antidepressants not only over promise and under deliver, but their use may permanently disable the body’s self-healing potential. We need a new paradigm: The best way to heal the mind is to heal the whole body. In this groundbreaking, science-based and holistic approach, Dr. Brogan shatters the mythology conventional medicine has built around the causes and treatment of depression. Pre-launch raffle prizes include a one year subscription to Butcher Box, a Vitamix S55 Blender, and more (over $2,000 retail value)! Get Your Copy of “A Mind of Your Own” today!